It is the worst of times for the oil industry. The price of crude has dropped close to 70% in a matter of months and does not appear to be in a position to recover any time soon. Earnings are down for companies that made record profits in recent years, leading them to take more than two-thirds of their rigs offline and sharply cut investment in exploration and production. An imminent rise in interest rates by the US Fed has not helped matters as scores of companies have gone bankrupt and an estimated 250,000 oil workers have lost their jobs. Many an analyst has tried to call the bottom by looking at the number of rig closures each company was triggering. What are the reasons for such a steep fall? In my opinion, there is only one. The easiest answer one can give for this is that of supply and demand. For the longest time, the Organization of Petroleum Exporting Countries (OPEC) could control the prices by increasing or decreasing production. As China experienced rapid growth along with the other BRICS countries, oil prices shot up. There was a correction in 2008 when the Global Financial Crisis occurred but as it reduced, prices were back up. This sustained high price of crude, above $75 a barrel, invited the curiosity of the United States, which figured out an alternative method to produce crude from shale rock, by a process called fracking. As long as the price of crude was above $75, Shale fracking was profitable and the world’s bastion of capitalism, armed with low-interest rates jumped in with both feet. The rise of the US as an oil producer has been swift. United States domestic production has nearly doubled over the last several years, pushing out oil imports that need to find another home. Saudi, Nigerian and Algerian oil that once was sold in the United States is suddenly competing for Asian markets, and the producers are forced to drop prices. Canadian and Iraqi oil production and exports are rising year after year. Even the Russians, with all their economic problems, manage to keep pumping. And then Iran signed the nuclear deal with the West and is now poised to come online with a few more millions of barrels. The real problem for many OPEC countries (and Russia) is that oil is the only significant product they can export and therefore cannot stop producing it, even if they want to as there is no other revenue generating a resource for them. All this is on the supply side. On the demand side, the economies of Europe and developing countries are weakening and with the US mandating that vehicles becoming more energy-efficient, demand for fuel is lagging. Price of crude is expected to stay low until the excess demand is absorbed and OPEC eventually realizes that it has to start producing less to ensure that supply and demand are in equilibrium. There is always going to be an overhang of the United States over OPEC as it continues to improve the efficiencies in fracking, thereby re-entering the crude production market at a level substantially lower than $75 per barrel. Between 2005 and 2014, the price of crude exceeded the price of petrol at the retail pump. Keeping the affordability of the paying public in mind, the government ensured that the consumer paid more or less the same amount of money. A good argument can be made by the government that it carried the burden of affordability for 10 years and it is now the turn of the consumer to share it so the money can be utilized in other projects. Another argument put forward is that lowering the prices drastically would result in people buying more cars and scooters which will overwhelm the delicate infrastructure upon which these vehicles will ply! But in reality, these are specious reasons. It has been proven time and again that a government, be it capitalist or socialist rarely does a good job of utilizing funds efficiently to grow the economy. The Soviet system of economic progress is long dead and India still seems to believe and act as if that is the panacea for all its ills. For completeness, let us detail what the government is going to do with this bonanza, as crude prices are expected to stay low at least till the end of 2016. Most likely the proceeds will be spent to re-capitalize sick public sector units, including some of the biggest banks. Attempts to privatize public owned enterprises have largely been unsuccessful. Almost 55% of the shares sold by Steel Authority of India Limited (SAIL) under the divestment plan was bought by public sector banks and other institutions, such as the Life Insurance Corporation (LIC) of India. It was as if the left hand was taking money from the right, albeit behind the back. Isn’t Keynesian economics all about amplifying the circulation of money? Is there a better way to grow the economy? Also, what would be an impact of this on inflation? The Consumer Price Index (CPI) of India is off by about 6% from the Wholesale Price Index (WPI), the main reason stated by the RBI Governor to not lower interest rates a few weeks ago. To understand the relationship between the changes in Petroleum prices and inflation, let us look at the experience of our neighbor Sri Lanka. If a neighboring country, with similar demographics and spending patterns, has done some research on the pricing of petroleum products and Inflation, it is worth perusing. Sri Lanka’s Central Bank commissioned a study by W.T.K. Perera to examine the impact of Petroleum prices on inflation in Sri Lanka. A well-researched document, it tracks the price of diesel prices with two consumer price indices, Colombo Consumers’ Price Index (CCPI) and Sri Lanka Consumers’ Price Index (SLCPI) and arrived at some interesting conclusions. But before we cut to the chase, let us get some definitions out of the way. Impact of petroleum prices impacts inflation in two ways — direct impact and indirect impact. Commodities such as petrol, diesel, Kerosene, cooking gas and electricity are impacted directly by a change in the price of petroleum crude. All other commodities such as vegetables, pulses, seeds and consumer goods are indirectly impacted by the price of crude. The time period chosen was 2002-2004. Before 2002, the diesel prices were strictly administered. Therefore, diesel prices were fairly stable during the period 1981-2001. But from 2002, it varied with the world market prices until September 2004, as diesel prices were subjected to monthly change. In other words, the Sri Lankan government was passing on the costs or savings as the case may be to the consumer. The results reveal that the indirect impact of changes in diesel prices on both CCPI and SLCPI is much larger than the direct impact. 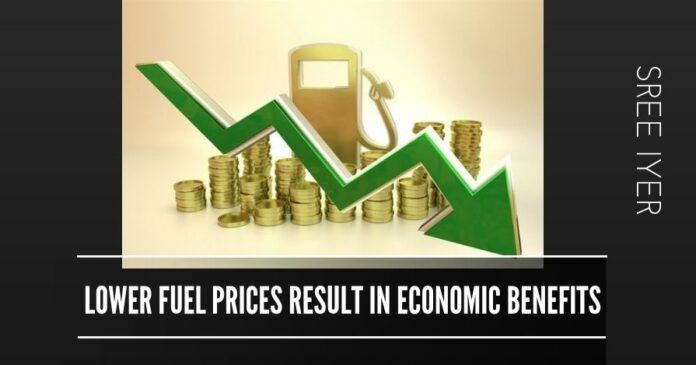 The study found that an increase in diesel prices by 10 percent would directly increase CCPI and SLCPI by 0.173 percent and 0.197 percent, respectively. This is due to directly impacted products. The same 10% increase would increase the indirectly impacted products in CCPI by 1.21 percent during the first month. In the case of SLCPI, the indirect impact of the same change in diesel price was 1.01 percent with a lag of 2-3 months. CCPI is a local area, pertaining to in and around the city of Colombo whereas SLCPI referred to the prices throughout the country. Suffice to say that direct to indirect impact on the CPIs is 1:5. A similar study was also done in Turkey, with similar conclusions. Till 2014, the Indian government was subsidizing the costs of petrol and diesel and finding other sources of revenue to absorb this hit. The study above tells us that a decrease in retail prices of petrol and diesel would impact the CPI much more, thereby bringing it closer to the WPI and killing the inflation bug. Once the government makes its intentions clear that the pump prices will follow the international crude prices, prices of commodities will fall quickly. CPI is high in India because of inefficient distribution and hoarding. Once it becomes clear that the same good will fetch a lower price the following day, it will incentivize the commodity sellers to lower prices quickly. A direct consequence of this is more money in the hands of the consumer. The savings rate of the consumer will go up, which in turn will make the deposits of the same public sector banks swell. A clear projection of low oil prices for an extended period does not occur often and India should grab this golden opportunity and give a price break to the consumer. The time is now. if the corporate thieves not getting enough. India has enough brilliant minds to solve any problems. But there is no need and will to solve problems as they keep hyenas alive. When computing the ‘economic benefits’ of cheap fuel, are we factoring in the (1) ‘price we pay for treating alarmingly increasing dreaded diseases like cancer, paralysis etc.’ & (2) the total’deterioration in our quality of life’? By adopting a ‘carrot & stick policy’ if we could totally abandon use of (hydrocarbon) fuel & implement alternatives like SOLAR & ANIMAL GOBAR GAS fuels – not only our ‘public health’, & ‘fiscal health’ will glisten but job market will get a huge boost. The title of the article is fine. One could take it as a premise. No need to offer proof. Who controls the price of oil? That is the most important question. The government has a small leverage, the rest is demand and supply. In last few years, investment in oil and gas projects has come down drastically. That is going to cause a supply shock some time. Doesn’t look good for certain. The common man will not understand all this jargon. Simple thing is that he will show his anger on the government. Period!